The state of Washington has some of, if not the most, comprehensive and explicit prohibitions on Internet gambling, of which online sports betting is just one type. These bans are found throughout the legal rolls and carry with them stiff fines and jail sentences for those found to be in violation. What’s more, the clear and exhaustive manner in which these laws are enshrined leaves even legal Washington sports betting sites based in foreign countries (where they are completely not beholden to US law) very little defensible legal ground to stand on. Nevertheless, the top legal offshore sportsbook operators still readily accept Washington sports fans as account holders – largely because these laws, pervasive as they are, are almost completely impossible to enforce. This lack of feasible enforceability makes betting on one’s favorite sports franchises and players a favorite pastime for many throughout the state. Additionally, the fact that the sportsbook sites we recommend – Bovada, SportsBetting, BetOnline and 5Dimes – are fully licensed, regulated and legal in their home countries means that these sites are safe, secure, and legitimate. However, the legal climate in the Evergreen state towards gambling disallows the legalization of sports betting to its own disadvantage. It stands to reason that the thousands of Washington residents who participate in sports betting regularly, whether at our legal sports betting sites or at unauthorized illegal black-market sites, could provide a large and stable source of income in the form of taxable revenues. Indeed, Washington Indian tribes operate 28 land-based casinos which generate $3 billion in annual revenue, so it would seem as though a broader legalization of sports betting would be of great benefit to the Evergreen State’s coffers. In our guide we will discuss these topics and more so that prospective bettors have a solid understanding of legal Washington sports betting and everything it entails. 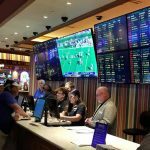 Is Land-Based Sports Betting Legal In Washington? Land-based gambling in the form of the lottery, bingo for cash prizes, and so on, are legal, but land-based sports betting is a different story. For now, the only kind of land-based sports betting legal in Washington are pools using the “square” method, wherein every participant has an equal chance of winning and can’t pick which odds they want. So Washington’s state laws are actually quite limiting in this regard. However, the solution to this conundrum that many fans of the Seahawks, Mariners, Sounders, Huskies and Cougars have embraced is the legal offshore sports betting site. We have some suggestions about which are the best out of this already excellent group, and we’ll discuss those at greater length elsewhere in this guide. For now, it’s best to consider that even though land-based sports betting isn’t legal for the most part in Washington, there are still online sportsbooks that can serve you. Online sports betting isn’t legal in Washington either, based on the state’s extremely tough anti-gambling laws. Online sports betting is in fact explicitly listed among the prohibited forms of gambling, unlike in some other states that leave the matter more ambiguous. This isn’t to say that our top recommended picks among legal Washington sports betting sites based overseas won’t accept Evergreen State players or that anyone has ever gone to jail for betting on sports online, but the fact remains that it isn’t strictly speaking legal to do. The only place to engage in legal Washington sports betting is at offshore sportsbook sites like Bovada, 5Dimes, SportsBetting, and BetOnline. These sites all accept Washington bettors, even though betting on sports over the Internet is technically illegal and a punishable offense (a Class C felony) in the Evergreen State. Nobody has ever been arrested or charged with breaking this law, however, and that’s because it’s almost impossible for the government – at either the federal or the state level – to enforce such a ban. We aren’t lawyers or legal experts, but you’re probably not going to get thrown in the slammer if you bet on sports in Washington. We just want you to have the facts, and one of those facts is that there is nowhere to bet on sports in Washington except online. There are plenty of places to bet in Washington if you like casinos – the Evergreen State has over two dozen tribal casinos that will happily take your money – so the question really out to be “where’s the closest place to me to bet on sports?” In that case, you definitely won’t find anywhere located in the state of Washington to wager on your favorite team, and that’s true whether you live in Seattle or Spokane. 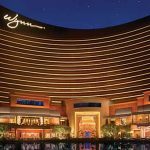 In fact, unless you want to hop a flight all the way down to Las Vegas, you won’t be able to bet on sports in any meaningful way at any nearby brick-and-mortar sportsbook. That’s no big deal though, as legal offshore sportsbooks like Bovada, SportsBetting, BetOnline, and 5Dimes all offer better odds and more convenience than Sin City has (via features like live in-game betting, mobile betting odds, and so on), as well as 100% legality, being licensed and regulated in their home countries by the gaming authorities there. It’s no stretch to say that our most recommended legal Washington sports betting sites offer more to the gamer than anybody else in the industry. As we indicated throughout this guide, the best foreign-based sports betting websites are Bovada, BetOnline, SportsBetting, and 5Dimes. 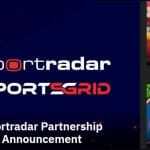 Each of these sites has its own advantages and special features, and keeping multiple sportsbook accounts open and active is something we fully endorse so you can make use of these perks (which range from different and compelling bonus offers to unique and sometimes complementary odds on the same game). However, these sites are pretty much the only names in the game in town when it comes to a legal Washington sports betting option. The Evergreen State has got some extremely comprehensive anti-gambling laws that explicitly prohibit online gambling of any kind – sports wagering included. That being said, all the offshore sports betting sites we recommend will accept Washington players, so actually placing a bet on the Huskies or the Seahawks won’t be a problem from a technical standpoint – it’s really just a question if you’re comfortable with potentially being in violation of a law that couldn’t really be much clearer. Nevertheless, you aren’t at much risk of actually being caught, and you would have the defense of using a site that is legal, licensed, and regulated – just in other countries. Washington sports betting and gambling laws are multitudinous and multiform. According to Washington’s Criminal Code, betting on sports via the Internet in the state is a Class C Felony. RCW 9.46.240 clearly states that it is illegal to knowingly transmit or receive gambling information over the Internet or by the use of “any similar means.” Furthermore, bookmaking is defined in RCW 9.46.0213, and if the authorities can prove illegal gambling activity took place, those found guilty could be looking at a fine of not more $10,000 and/or a prison sentence of up to five years. 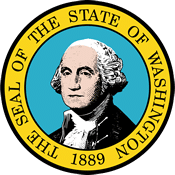 Laws this explicit prove that Washington is not beating around the bush when it comes to its hardline stance on being an anti-gambling stronghold. However, prospective players at our top recommended legal offshore sports betting sites should be aware that these laws, as well as federal laws like the Wire Act of 1961 and the Unlawful Internet Gambling Enforcement Act of 2006 (UIGEA) are not aimed at them. Rather, these laws are on the books in order to keep organized criminals and other bad actors out of gambling, so while an individual who lays a few dollars on the Mariners might be in violation of the law, there haven’t been any arrests made regarding placing what are considered to be illegal bets online. Washington is a state rife with solid pro and college teams on which residents of the state are interested in betting. Extremely strict gambling laws to the contrary, Washington residents’ enthusiasm for wagering on their home teams (primarily those based in and around Seattle, the most populous city) isn’t deterred in the slightest. That’s because with pro franchises like the Mariners, Seahawks, and Sounders Football Club (that’s soccer to us Americans), and elite collegiate programs like the Washington Huskies, the Washington State Cougars, and the Gonzaga Bulldogs, the case for legal Washington sports betting couldn’t be much better. Washington’s horse racing industry isn’t as well-developed as some other states with a mature gambling industry, with the Evergreen State having only two tracks: Emerald Downs and Sun Downs, both located in the city of Auburn. You’ll only be able to engage in any live wagering on horse racing at those two tracks, but there are a dozen authorized off-track betting facilities at different gambling facilities around the state. Horse racing betting in Washington is overseen by the state’s dedicated Horse Racing Commission, and the Commission’s website lists the locations of all these pari-mutuel off-site betting sites. Our recommended legal Washington sports betting sites also offer the option to bet on horse racing, but they have the advantage over their counterparts based in the Evergreen State. This is because of the fact that our foreign-operated legal online sportsbooks have odds on horse races taking place all over the world, not just in the state of Washington. That’s not even getting into the other advantages that sites like Bovada, SportsBetting, BetOnline, and 5Dimes have: online, you’ll get more comps, bonuses, and special event promotions than even the most long-standing and preeminent horse racing tracks and off-site pari-mutuel betting facilities in the US have to offer. The Evergreen State has fairly permissive social gambling laws, all things considered, but state laws definitely crack down hard on daily fantasy sports (DFS). Seriously, playing daily fantasy sports in Washington is a no-go, and that’s because the state is the only one in the entire US that absolutely, unequivocally puts the kibosh on DFS to the extent that it does. The state’s attorney general’s office has gone so far as to arrest, charge, and prosecute an individual running a NASCAR fantasy sports operator back in 2011. The Washington State Gambling Commission issued a statement back in ’11 after David Watkins (the owner and operator of the Fantasy Thunder site) was arrested that basically asserts that DFS is a game of chance and is thusly prohibited under state law, according to RCW 9.46.0225. This flies in the face of the federal UIGEA, which classifies DFS as a game of skill, even though players are eligible to win monetary rewards and there is certainly cross-shopping between fantasy contests and sports betting. A bill to legalize DFS in Washington was put forward during the 2015 legislative session but it wasn’t passed, despite some earnest interest from the state’s Gaming Commission. Can I Bet Real Money On Sports In Washington? You can bet real money on sports in Washington, but more importantly, you can win real money – but only if you’re good at picking winners, of course. You will also need to do your betting at our recommended legal offshore sportsbooks because several Washington state laws specifically mention and prohibit online gambling. Fortunately, those laws, explicit as they are, really only apply to betting that goes on at in-state websites, leaving the practice of legal Washington sports betting in a gray area of the law. You’ll have to deposit into your money at our top legal sports betting sites using the tried and true method of sending a check in the mail or make a deposit using Bitcoin. This is owing to the prohibitions placed on financial institutions that keep them from processing transactions related to online gambling. Is Online Sports Betting Safe In Washington? Online sports betting is safe in Washington, even if in most forms it isn’t strictly speaking legal in the state. That’s because our top picks – Bovada, SportsBetting, BetOnline, and 5Dimes – have to go through intense security checks in order to qualify for licensing by their home countries’ gaming authorities. Because these legal sports betting sites have to comply with these extremely strict regulations, it should give players and account holders a feeling of security knowing that they are dealing with a professional service and not an unauthorized black market bookie. Users can rest assured that their personal and financial information is safe at our recommended legal Washington sports betting websites. 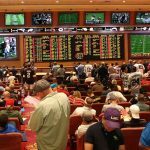 Will Sports Betting In Washington Ever Be Legal? While it is possible (and even probable in the long term), it isn’t very likely that sports betting in Washington will be legal any time soon if left up to the politicians in Olympia. Their predecessors took a hardline stance against gambling way back when, and subsequent generations of Washington lawmakers have held onto that viewpoint and defended against even the most gradual of updates to the longstanding bans on sports betting. In the meantime, bettors will have to make use of our top recommended picks in the offshore legal sportsbook market to lay a wager on their favorite sports teams. Will I Get Arrested For Sports Betting In Washington? We can tell you that nobody has ever been arrested for sports betting in Washington, especially not at offshore sports betting websites like the ones we recommend, but we also wouldn’t be doing the right thing to tell you that nobody WILL ever be arrested for it. That’s because, according to Washington state law, betting on sports, even over the Internet, is illegal. Still, it is worth noting that there has never been an arrest made in the state of Washington for betting online, much less an instance of anyone being charged for doing it. 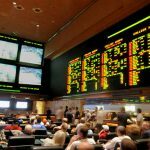 What Is the Sports Betting Age In Washington? Our top picks among online sportsbooks only require users to be a minimum age of 18 years old to bet on sports at their sites. Since Washington doesn’t have a similar rule about sports betting ages (as sports betting isn’t allowed in-state anyway), it’s safe to bet at our recommended legal Washington sports betting sites if you’re 18 or older. Are There Mobile Sports Betting Apps Available In Washington? Not only are there mobile sports betting apps available in Washington, they are some of the best sports betting apps available anywhere on the Internet. Here’s the catch (if you want to think about it as a catch): You can’t download sports betting apps for these sites from the App Store or via Google Play. Instead, you have to use the “web app” experiences provided by these sites via your mobile browser. However, this isn’t really a downside when you consider the extra attention to detail this affords the developers of these mobile sports betting apps, allowing them to make fully streamlined products for their end-users without any corporate Apple/Google oversight. The leading legal sports betting sites have fully embraced the smartphone revolution, so it behooves smart bettors to fully embrace these mobile sports betting apps. Where Is The Best Place To Bet On Sports In Washington? The best place to bet on sports in Washington is not actually in Washington because the state doesn’t allow it – simple as that. However, you can bet on sports if you live in Washington despite the state’s prohibition on the practice if you use one of our top-rated legal offshore sports betting sites (Bovada, 5Dimes, BetOnline, and SportsBetting, as we’ve mentioned throughout this guide, though BookMaker and BetDSI are also good options, albeit less popular ones). Should I Use A Local Bookie In Washington? If a sportsbook is set up in the state of Washington, you should absolutely avoid doing business with that organization. Any local bookie in Washington is going to necessarily be operating in direct violation of state law, so you could be looking at never getting paid any winnings as a best-case scenario. On the other hand, the worst-case scenario is the local bookie is actually part of a sting operation looking to bust Washington residents who just want to bet on the Seahawks or the Sounders FC to win another national championship. There is just no good reason to use a local bookie in Washington, especially given the ever-present option to use a legal offshore sportsbook like the ones we recommend. Do Any Casinos In Washington Have Sports Betting? There are several tribal casinos in Washington, but you will not find any casinos in Washington that have sports betting. Betting on sports is illegal in the Evergreen State, and it has been for some time, with no plan on the close horizon to change that fact. That means the only way to possibly engage in legal Washington sports betting is to use one our legal offshore sports betting sites. Can I Bet On Sports With My Friends In Washington? Betting on sports with your friends in Washington is possible from a technical standpoint using mobile sports betting apps and the live in-game sports betting option available at all the leading legal Washington sports betting sites based overseas. Whether such a thing is 100% legal, given Washington’s laws, could be another story. However, betting on sports in a pool using the “square” method is allowed, according to RCW 9.46.0335. The square method is that method of sports betting wherein a board is divided up into 100 equal squares, each constituting a chance to win in the sports pool and each person in the pool pays an entry of $1 or less. Social card games for money are also allowed explicitly by law in RCW 9.46.0351, but that doesn’t allow for betting on sports with friends, so if you still aren’t sure about the legality of such, you may want to check with a legal Washington sports betting expert before proceeding any further.